Ohio law presumes that parents should share parenting responsibilities equally after divorce. If you want to limit the other parent's access and decision-making with regard to your children, you must ask the judge to allocate parental rights and responsibilities accordingly, and you must demonstrate why this is in the best interests of the children. The judge must consider many factors, including the wishes of the children and the parents; the mental and physical health of the parties; family interactions and relationships; any history of family violence, sexual abuse, child abuse or neglect; violations of a previous visitation or child support order; or plans by either parent to move out of state. In the final order, if the judge agrees that a shared parenting plan is not in the best interests of the children, she will designate one party as the residential parent and legal custodian. The other party will be called the nonresidential parent. 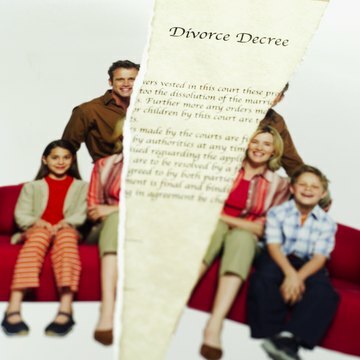 Let the judge know when you file for divorce that you do not want a shared parenting arrangement. When you fill out the complaint, the document that begins the lawsuit, be sure to check the box for "Allocation of parental rights and responsibilities" rather than the one for a shared parenting plan. Review the list of factors that the judge considers when making a decision on parenting plans. For each factor that you think applies to your situation, make a list of documents, photos and other evidence that could be helpful to the judge. If, for example, you believe that your spouse plans to move out of state after the divorce, you could gather evidence that shows he has accepted a job and been house hunting. Gather evidence that could be helpful to your case. The types of evidence you need depend on which factors weigh in your favor. If, for example, the other parent has been physically abusive, you might want to collect medical records, police reports, conviction records, witness statements, and tapes of 911 calls that would support your testimony. Ask the judge to order an evaluation of you, the other parent and your children. If the judge agrees, an investigator will look into each parent's income, finances, past behavior, medical and psychiatric history, and home environment. The investigator will prepare a report and may also appear in court to testify about her findings. Ask the judge to appoint a guardian ad litem to represent the interests of the children, if appropriate. A guardian ad litem may be a social worker, lawyer or other professional qualified to help the judge make a custody decision. Arrange for a mediator, a neutral third party, to help you and your spouse talk about the parenting plan. You can also try to work things out between the two of you but mediators are trained to help people talk together constructively. Reduce your agreement to writing if you reach one. Talk with an attorney about strategies and how to gather evidence. If you reach an agreement with the other party, an attorney should review the documents to make sure it is in the right format and addresses all of the issues including visitation and child support. Appear at the final hearing. If you and your spouse have reached an agreement, you may present it to the judge at the hearing. If there has been no agreement, prepare a parenting plan to present to the judge and be prepared to present evidence. Tell the judge under oath why you believe that shared parenting will not work and why you should be the residential parent. If you have submitted a parenting plan to the judge, be prepared to answer questions about it. Answer questions from your ex-spouse or his attorney. This procedure is called cross-examination. Listen to the questions carefully and ask for clarification if you are not sure what is being asked. Answer each question truthfully. Question your witnesses about facts that may make a difference to the judge. For example, if you want to prove that your spouse hurt you physically and someone saw that happen, ask that person to testify in court. You may also call witness to testify about your parenting skills and character. If you have an attorney, that person will do the questioning. Cross-examine your spouse and his witnesses. If you have an attorney, she will do the cross-examination. This is the opportunity to poke holes in the other person's case. If, for example, your spouse says that he was the children's primary care-taker but you know that he was at work for at least 12 hours a day, ask questions about his schedule that will reveal the truth. Ask the judge to speak with the children about their wishes, if appropriate. The judge will speak to them privately rather than in the courtroom. Ohio law prohibits parents from asking their children to testify in court about custody issues. Prepare the final order according to the judge's decision. If you have an attorney, she will prepare the order for you. Ohio Family Law Blog: The Legal Distinctions Between "Sole Custody" Versus "Shared Parenting"